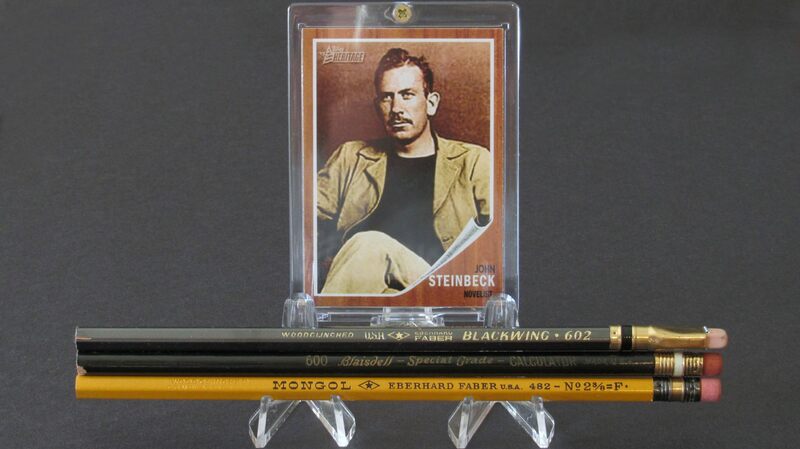 Among pencil fans, John Steinbeck is a well-known fellow traveler. Pencils were his tools of choice when writing the drafts of many of his novels on legal pads. Although he is known to have tried many different pencils, the only three we know he recommended by name were the Eberhard Faber Blackwing 602, the Eberhard Faber Mongol 480 2 3/8 F and the Blaisdell Calculator 600. Mr. Steinbeck’s three favorite pencils are visiting 25 members of the Erasable Podcast community (the Mongol is a hexagonal rather than Steinbeck’s favored round). The pencil trio, accompanied by a photo of John Steinbeck and a Field Notes notebook, are making stops throughout the United States then traveling on to the United Kingdom, Ireland, Guatemala and Australia before returning home. Hosts of the Steinbeck Three are encouraged to post a photo of the pencils and their Field Notes entry on the Erasable Podcast community Facebook site. You can track the Tour’s progress via the map below. We will update the map as the Tour reaches each new destination. Green symbols indicate the Tour has arrived. Red symbols indicate upcoming destinations. Nice! How about a third color for already visited? Assume green means where it is at the moment?